A woman named Angel Janes had a life-altering moment recently. 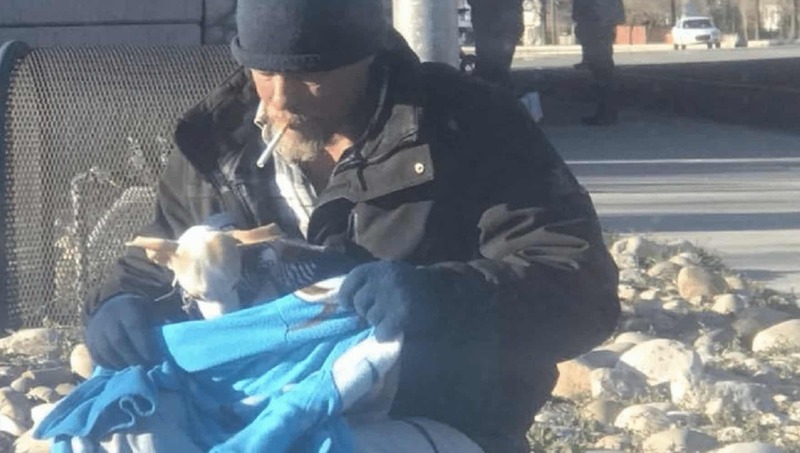 Angel spotted a homeless man that warmed her heart and thanks to her sharing her story, he’s now inspiring so many others online. Angel was driving home from a commute in Salt Lake City, Utah when she spotted a homeless man holding a sign. The sign was asking for money or work. Unfortunately, she had neither to offer. But Angel did have a cigarette so she stopped by to give it to him. That’s when she noticed something in his lap. The homeless man, named Ron, took the cigarette with thanks. That’s when Angel saw he was clutching a tiny chihuahua in his lap, all wrapped up in a little blanket. Ron was trying his very best to keep the dog warm. Janes was so moved by the man’s care and compassion to the tiny creature. The dog wasn’t Ron’s dog, in fact, he was just trying to keep it safe. Ron asked Angel if she’d be able to give the dog a good home. Unfortunately, he’d seen the dog being dumped on the highway just two hours before. He saw a woman dumping the dog on the busy thoroughfare and he was terrified of the idea that this dog would get hit by a car. Ron rushed over to the little dog and took him away from the highway for safety. As Angel wasn’t in a position to adopt a dog, she decided to share the story on Facebook to try and help find a willing volunteer.